This is the first of two posts for Lois Ehlert's birthday. The first is a list of 10 cool things I learned about Lois Ehlert while I was snooping around in her books and on the web. The second post will be after November 10, the day I will be celebrating her birthday with my son's preschool class. I can't wait! It should be loads of fun sharing this immensely creative children's author with them. 1. Hands: Growing Up to Be an Artist - This book highlights the influence Lois Ehlert's mother and father had on her creativity at a young age. Her mother and father were hard working people that spent their free time creating; mother was always sewing and father was always working with wood. They provided Lois with a folding table which was her special place to create her artwork. Additionally, there was always scrap material that was readily available for her projects. (From many sources including Just One More Book) Now, Ehlert uses her creativity to develop books that she hopes encourage children to make their own art. 2. Color Zoo - This book received Caldecott Honor is 1990. It's companion book, Color Farm, also features the same format where animals transform with each turn of the page as diecut shapes are removed to reveal a new animal. If you like books that feature die cuts, check out another by Ehlert, In My World . 3. Eating the Alphabet: Fruits and Vegetables from A to Z - Lois Ehlert loved all the displays of fruits and vegetables at a local store. Each week she traveled to the store to purchase things that started with the same letter, beginning with the letter A. She would then head home and paint the items she purchased. She looked forward to eating all the goodies when she was finished painting. (Teaching Books) Ehlert really did "eat the alphabet" when she made this book. 4. Leaf Man - "When I see a beautiful leaf, I have to pick it up." Lois Ehlert mentioned in the author note, "It is something I've done all my life." To create this book she carried a plastic bag during her travels just in case she were to find the perfect leaf. Color copies were then made of the leaves to capture the color in the form they were found. The leaves were then arranged to make Leaf Man and a series of animals and plants. Leaf Man is a perfect example that nature provides the best art supplies and as Lois Ehlert says, "they are free!" 5. 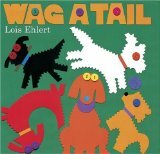 Wag a Tail - Lois Ehlert loves to collect "good stuff" which has lead her friends to call her a pack rat (Harcourt). Bits and pieces of previous paintings and scraps of fabric that she had saved helped create some of the elements in this book. Ehlert used paper left over from Leaf Man and Top Cat. She used old buttons for some of the dog's eyes. Plus she used her mom's pinking shears which were featured in Hands. (Wag a Tail Author's note). The idea for this book came from meeting people and their dogs on her many visits to Farmer's markets. (Just One More Book). 6. Moon Rope/Un lazo a la luna , Cuckoo, and Market Day: A Story Told with Folk Art - Lois Ehlert traveled to Peru and Mexico and became very interested in the culture especially the folk art. All of these books show the influence of her travels. Market Day incorporates images of many folk art pieces while Moon Rope and Cuckoo are presented with bilingual text. 8. Under My Nose: Meet the Author Series - Lois Ehlert lives in Milwaukee, Wisconsin near Lake Michigan. The cover of this book is a picture of her holding one of her ice fishing decoys that is a part of her large collection (Just One More Book). Some of her other decoys are in the book Market Day too. Check out a historical overview of ice fishing decoy carving at fishdecoy.com. 9. Snowballs - Lois Ehlert started to experiment with three dimensional objects in her collages with this book about a snow family. Items like bird food, buttons, and clothing had to be carefully photographed so shadows did not impact the image. 10. Lois Ehlert said, "I hope all children will look more closely when they are outside." (Harcourt) She has many other books about animals and nature including Pie in the Sky, Feathers for Lunch, Oodles of Animals, Planting a Rainbow, Red Leaf, Yellow Leaf, and Growing Vegetable Soup. Also her latest which was released July 20, 2010 - Lots of Spots! Don't forget to look for another post very soon as I report on the birthday celebration I will be having with my son's preschool class! Click here to read the Lois Ehlert birthday post from 2009. I love her use of color in her illustrations! Love Color Zoo! It's one of our favorites and I hadn't heard of Color Farm (where have I been?) so we'll have to look for it. Thanks! Hope you have a fun celebration today! Looking forward to reading your post and hearing about the kids' reactions to her books.